Nikos Baroutsakis is a guitarist and transcriber from Athens, Greece. His work includes performances as a soloist and in chamber music ensembles, as well as arrangements of compositions for the guitar. 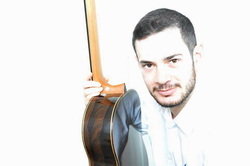 Born in 1989, Nikos began his formal studies on the guitar with Dimitris Pappas, with whom he obtained his Soloist Diploma in 2011. His participation in the 2010 edition of the Volterra Project Summer Guitar Institute in Tuscany, Italy, introduced him to Antigoni Goni. Motivated by her inspiring artistry and teaching, he continued his studies under her guidance at the Royal Conservatory in Brussels from 2011 to 2015. In addition, he studied historical music on Baroque and Romantic guitars with Dirk de Hertogh, and Contemporary music with Bart Boukaert. During that four year period he obtained a Bachelors and Masters Degree of Arts in Music. In the summer of 2015 he participated once more in the Volterra Project thanks to a scholarship provided by the Institute for Culture and Education in Brussels, under the patronage of the Metropolitan Athanasios of Achaia, and the generous contribution of the Greek community in Brussels. Furthermore, Nikos is interested in extending the classical guitar repertoire through transcriptions of 20th century music. His arrangement for two guitars of the orchestral work “The Light” by Phillip Glass was premiered in Brussels in 2015 and received great critical acclaim. Finally, he has participated in master classes with highly acclaimed guitarists such as: Sergio Assad, Dusan Bogdanovic, Elliot Fisk, Oscar Ghiglia, Timo Korhonen, Elena Papandreou, Konrad Ragosnig, Gary Ryan, and Raphaella Smits.